There has been an unlikely winner in the 2015 Malmesbury In Bloom competition: the Hyams second-hand car dealership. The car garage won not one but two categories at this years competition, which celebrates floral displays in the small Wiltshire market town. Thanks to its beautiful hanging baskets and window boxes, the High Street-based family firm took the top prize in the best commercial premises (including restaurants and pubs) category, as well as the category for window boxes, hanging baskets and containers. On its list of attractive features, floral splendour is not usually high on the list for a car dealership, with the quality of its showroom, stock and salespeople more commonly stealing the show. Indeed, these are the high-value items that a business must be sure to protect with its combined motor trade insurance policy, which unfortunately might not stretch to cover award-winning begonias and fuchsias. 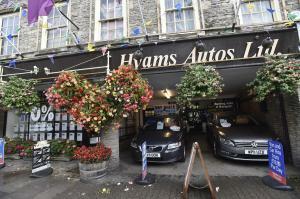 Speaking to the Gazette and Herald, Chris Fox, the service manager at Hyams, said: “It’s something the garage has always done and we’ve won Malmesbury In Bloom many times over the years.